One entire financial quarter since Andy's retirement and the lad remains active. On a grey September lunchtime when he could easily be forgiven for sitting at home with a footspa in front of Murder She Wrote, he's out there, engaging with the real world to gizza lift to the outskirts of The 'Swich. Felixstowe Road is full of takeaway joints and devoid of places to sit and eat. Bowled over by the warm welcome inside. Stretching the rules today, admittedly, since there's no seating to be had, but hey. Chat with the nice lady to learn that she's of Hungarian origin, giving rise to some footy banter, naturally. Fridge is overflowing with San Pellegrino variants, and there's a healthy selection of healthy pre-prepped bagels: chargrilled chicken for me. That's one outstanding crisp stand loaded with Berts, Guinness, Hobgoblin and more. Too big a choice boiled down to the sausage and mustard. Cakes. Oh my goodness, the handmade cakes. Cut above is Sylv's, with all manner of truffles, macaroons, bonbons, meringues, et cetera. I didn't make it past the Nutella custard profiteroles, especially given today's 3-for-2 offer. Off we trotted, happy campers both, to nab a picturesque parking spot by Murray Road Rec. Took away a really good latte macchiato, too. They make celebration cakes, they do low carb, they cater for gluten free. 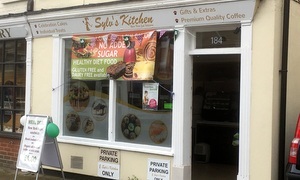 If for tasty food you're itchin', take yourself to Sylv's kitchen. If it was a car -- Puli. If they were passing by -- Sylvia Syms.